The graph shows single family home prices in Olentangy schools for the past 15 months through the end of June 2010. Homes in City of Columbus neighborhoods including Olentangy Glade, Olentangy Meadows, Prestwick Commons, Prestwick Green, Woods of Olentangy, Wynstone and others. City of Powell neighborhoods such as Bartholomew Run, Deer Run, Falcon Ridge Golf Village, Olentangy Ridge, The Retreat and more. Homes in Genoa Township neighborhoods including Grand Oak, Highland Lakes, Sheffield Park, Willow Bend and others. Liberty Township neighborhoods like Big Bear Farms, Dornoch Estates, Wedgewood, Wedgewood Park, Woodland Hall and more. Homes in neighborhools incliudling Abbey Knoll, Glen Oak, Highmeadows Village, McCammon Chase, McCammon Estates, North Orange, Oak Creek, The Shores, Walker Woods, Waverly Place and other Orange Township neighborhoods. The Columbus Dispatch in late June said prices are falling in Central Ohio. A similar graph for the area that is the entire Columbus Board of Realtors® MLS (multiple listing service) for the past 15 months: Columbus home prices are down? Sale prices in June did NOT go down in the total area served by the Columbus Board of MlS. 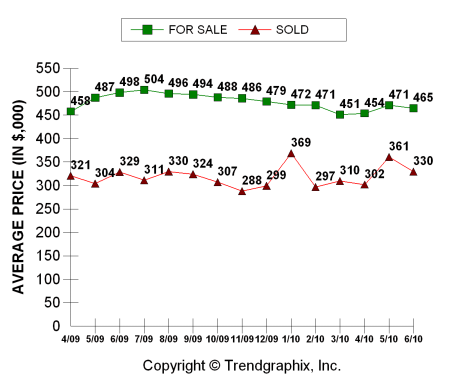 Published July 2010 based on data available from the Columbus Board of REALTORS® at the end of June 2010. TrendGraphix reports presented are based on data supplied by the Columbus Board of Realtors. According to Trendgraphix neither CBR nor their MLS (multiple listing service ) guarantee or are in anyway responsible for it’s accuracy. “Information deemed reliable but not guaranteed.” No guarantee from me either! If you use the Olentangy schools homes for sale link above you will search the online inventory of Central Ohio homes on the Real Living HER site. You can search by ZIP code or school district. You will be offered the opportunity to receive listings directly from the Columbus Board of Realtors MLS (multiple listing service) in real time. You can know the true status of those properties you are interested in. Originally published on Discover Columbus OH – Columbus Ohio real estate.